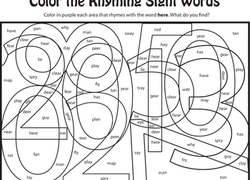 This alphabet word search doubles as a coloring sheet! 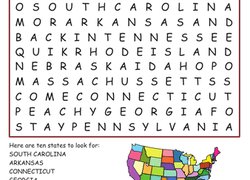 Help your kindergartener get in gear for reading and writing with this fun word search. Give your kid help with his science skills with this worksheet, which practices natural disaster vocabulary. 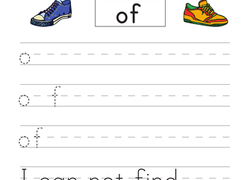 This printable year one worksheet will give your child practise with the sight word "of". It's like a zoo in here! There are 17 hidden animal words in this jumble of letters. How many can your kid find? 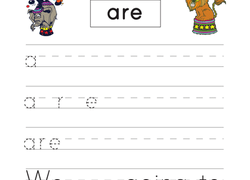 Get a handle on your r-controlled vowels with this reading worksheet that focuses on "er", "ir" and "ur". 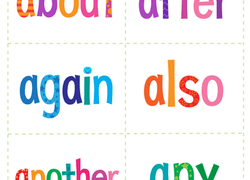 Write the Sight Words: "Are"
Help your child learn the sight word "are" with this printable year one phonics worksheet. This picture is missing its colors! It's up to your little readers to figure out where to put each colour. 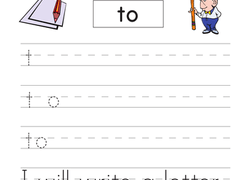 Write the Sight Words: "To"
Looking for a phonics worksheet to help your child with sight words. This printable will give him practise with the word "to". 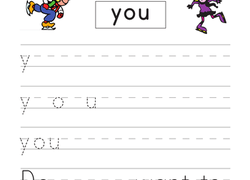 Write the Sight Words: "You"
Looking for a phonics worksheet to help your child with sight words? This printable will him practise with the word "you". Boost your child's reading skill with this year two reading worksheet that helps your child learn sight words that rhyme with 'here'. 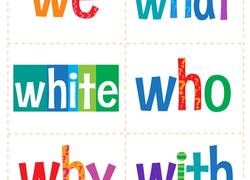 Help get your kindergartener ready to read and write with this word search featuring simple words that start with W through Y. Little writers, get your pencils ready! It's time to learn some sight words. Say each word aloud with your child before he writes it. Help your year one students keep track of new words by drawing out their own definitions using this helpful worksheet. Help your 1st grader gain confidence as a reader with sight word flash cards that you can cut out and tape around the house. Includes words from about to any.